Areachap – Copperton Metallogenic Province: Volcanic massive sulphide (VMS) and sedimentary exhalative deposits (SEDEX) Zinc – Copper mineralisation has been recorded along a volcano-sedimentary belt some 200 kilometres in length (Figure 2). Several major massive sulphide occurrences are noted within the province including the Prieska, Annex, Keider, Boksputs Project, Rooiputs Van Wyks Pan and Kantienpan deposits. These have apparently been tested by drilling in the past, although limited information is currently available and the Company continues to source and compile historical data. In addition, the SACG volume notes that at the Boksputs Prospect, only one sulphide body has formed a gossan and the remainder are blind to surface increasing the potential for further bodies to be identified. 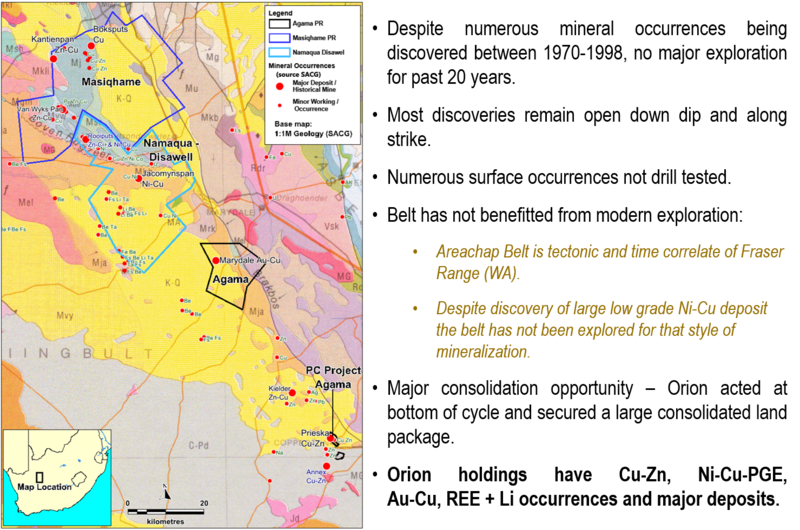 Jacomynspan Copper-Nickel Metallogenic District: Copper nickel mineralisation has been identified at a number of localities associated with mafic intrusive lithologies. 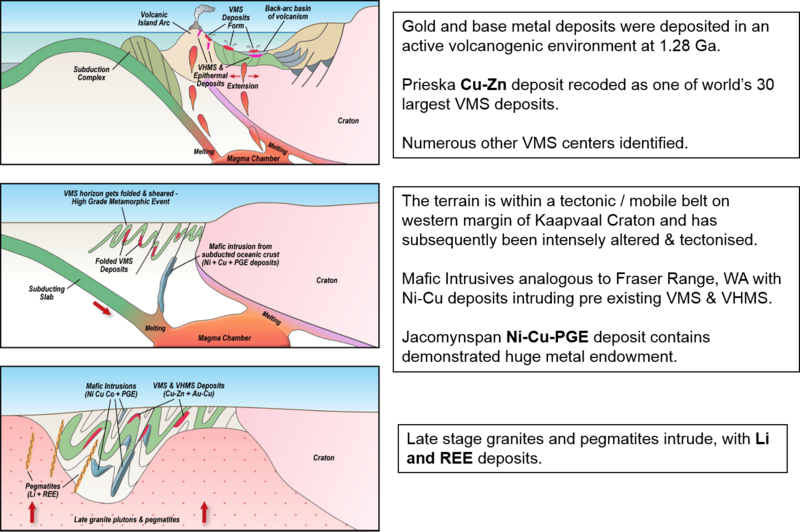 The mineralisation, age, tectonic setting and metamorphic alteration of these mafic – ultramafic intrusive bodies are strongly analogous to what is encountered in the Fraser Range, Western Australia. The known occurrences trend northward toward the Masiqhame prospecting right where the volume notes: “the presence of low tenor Cu, Ni, Co and Zn in graphitic and banded carbonaceous schist” and suggests that the strange metal assemble may represent leakage of nickel-copper mineralisation associated with an underlying intrusive body passing through the VMS / SEDEX Copper-Zinc mineralisation. The Orange River Pegmatite Belt contains recorded occurrences of pegmatites containing beryllium-columbite-tantalite with lithium mica and spodumene and in some cases small scale mining of these minerals has been noted.